Hydrobolt are a market leader in the manufacture, distribution and stocking of specialist fasteners, stud bolts and pipeline products for a number of industries including oil, gas, petrochemical and power generation. Hydrobolt employed a raw materials storage system that involved a manual process for picking bar and tube sections, which was both inefficient and also raised health and safety concerns for the operators involved. They needed a system that would offer increased capacity to cater for future demand whilst addressing any health and safety issues. The ultimate aim was to have a more organised and safer stores environment where products could be located and moved quickly to the production processes without the need for manual handling. 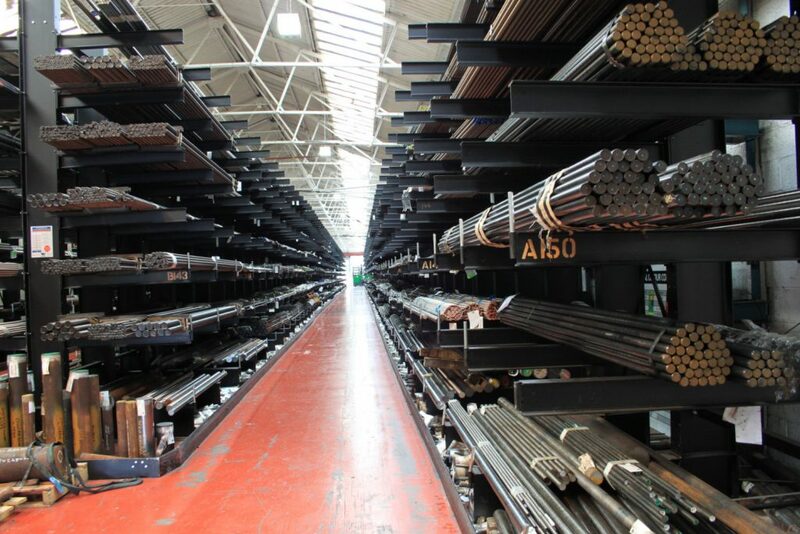 Following a site visit, Wickens offered a bespoke cantilever racking and guide rail system solution that would increase capacity and enable product to be picked without the need for manual handing. During the planning phase, Wickens cooperated with Combilift, a specialist forklift manufacturer, to ensure that the interface between the two systems is working perfectly. The Combilift side loader trucks are now used to transport materials across the site in a fast, yet safe manner, and they are guided along the racking aisles by a Wickens guide rail system that prevents accidents and damage to the new racking system. More than 200 meters of 4,000mm high cantilever racking were installed in the Hydrobolt warehouse, giving a capacity to store in excess of 2,000 tonnes of material over 7 storage levels. He confirmed that, thanks to the Wickens system, any Health and Safety concerns were now fully resolved, whilst they had also gained a large amount of additional storage space for future growth. In addition, it allowed a smoother material flow and speeded up the whole manufacturing process as raw materials could be delivered straight from stock to saws and machines. Smaller teams are now required to complete both stocking and handing, none of which are carried out manually. Less human resource and reduced operation times have boosted the efficiency of the whole production process. Ian added “This warehouse project exceeded all our expectations – absolutely everything was spot on”. Find out more about Cantilever Racking or email us enquiries@wickens.co.uk for more information on our product range.